Congrats to Batrachus for the winning entry and 50 duck prize. Thanks to everyone who entered and voted! Here are the final results of the Caption this drawing caption contest. "No thanks, I prefer Bindows." Steve Jobs:"Bet you I can make em buy garbage"
Introducing--who cares, you'll buy it anyway. Oscar the Grouch sold out to Apple Inc. The new Apple iTrash. Throw your money away! Oscar upgrades to an Apple product. iTrash: Same object, new name, higher price. Costs more to iTrash your iPhone, so iKeep it! Apple will try to sell anything these days. "Apple.. this design has BIN done." Open the 'Windows'.. New Apple product stinks. "iCan" For holding products over one year old. The NEW iCan Sh17: OS XII Raccoon INCLUDED! Where do the tech apple cores go? Introducing the world's most expensive trash..
Apple's idea of a "Recycling Bin"
Bums will save up for this. Here's the new Apple console: the Crapintosh! The New ITrash! Sold in an alleyway near you! Apple presents the $1000 iGarbage. The only Apple product in there is the Newton. Urn with Steve Jobs' remains, with controller! 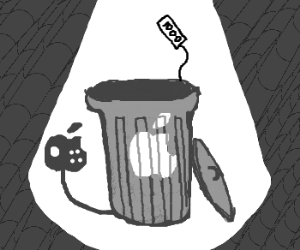 The new MacPro is an overpriced trash can. iTrash is the highlight of 2013! The new apple iRony, only $1000! Apple have bin forced down by profits. Apple iTrash by Apple! Now iTrashier! APPLE! iTrash? Apple is getting desperate nowadays. The apple i bin! This changes everything! Throw away money, and get trash apple phone! iTrash stores all of your Apple products. Old rubbish apple products are expensive. iTrash now in the Spotlight! Apple is an expensive old trash! Apple Inc: Buy the trash we sell !!! I-TrashCan: The newest gaming console. Store your Macs and Iphones in the new iCan! NEW Gen XXI iTrash!!! Charger sold separately.